You have to give Microsoft points for persistence: They're still trying to fix Windows, they still own Hotmail and OneDrive (or whatever the name is now), and they are still pushing Bing. The thing about Bing is that it's deceptively effective and has since become my default search engine for a very good reason: It's faster and more accurate. I find a link directly related to my search within the first page of returns on Bing. Further, they are not necessarily going to be the sites with the best branding or name recognition wich, while it may be naive, instills some amount of confidence within me. Sure, more pertinent links with better information may be available a bit further down but after numerous trials over the course of the last several months, I have found that Bing reveals more relevant search returns than its primary competitor. Suggestions for more narrowly-worded and related searches appear above and alongside my search returns - areas Google has shamelessly monetized by selling ad space to companies only sometimes tangentially relating to my original search. With Google, the first 5-10 returns are ads (barely delineated from organic search results by a near-transparent, barely off-white lightbox); the next is Wikipedia, which invariably commands top-place on Google these days; the next 20+ entries are nowhere near the sites with the best information but the best SEO; and both those returns as well as the next 20+ consist solely of content directly lifted from Wikipedia, witout so much as a single edit or spelling correction. Many of them even contain the word "wiki" somewhere in their URL. If you wait about six months to perform the same query, the majority of those returns will have disappeared but while many of the free, fly-by-night wiki communes will have been abandoned after a handful of entries or disappeared entirely (often with the whole hosting domain), several more will have replaced them using the same SEO techniques and lifted Wikipedia copy. Not only does it take longer to find relevant information on Google, the sheer breadth of it (despite the repetition and barely-perceptible ads) makes it more difficult to determine which is the most accurate, replete, and overall informative. On the flip side, Google's database dwarfs that of Bing so while the latter remains my preferred search engine, I find myself resorting to Google more often than I like, performing painstakingly, semi-thorough fact-checking and research by poring through dozens of SEO-optimized but utterly useless pages. Google's basic algorithm has always depended more on popularity than relevance or accuracy and it's really starting to show. 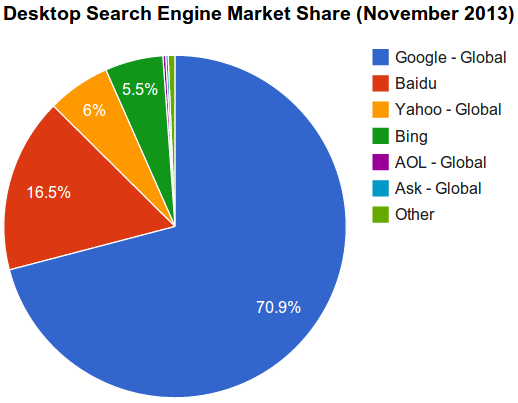 The only reason Google commands the overwhelming market share of search is name recognition, period. Its performance simply belies whatever statistics, public perception, or advertising hype is being reported. Further, Google definitely engages in unfair practices when it comes to favoring its search engine as the default for its Chrome browser: Mine is set to Bing yet when my Chrome launches, it opens windows to both Bing and Google - with Google on top. Google is the overwhelming leader in this industry but whenever I read glowing reviews such as this one (however seemingly informative), having literally experienced a profoundly different experience over what I consider to be a fair time, I have to question the blogger's veracity and integrity. This is especially true when you realize just how many similarly-written posts like this you find and how many of them use the same sources and statistics to make their point. After all, Google was the leading campaigner against advertising on personal blogs (excepting AdSense) but is well-known to offer influential tech bloggers incentives and even sponsorships to write favorably regarding their product(s). Not to mention running ads in their returns.